Chalk Paint Vs Milk Paint? What’s the Difference? If you're on our email list you know I love finding new ways of doing things - simply and inexpensively. The kitchen cabinets below were professionally done, but you can get the same look following some of the tips below. It's a long post so grab a cup of coffee or a pot of tea. Let's talk about milk paint and chalk paint. I've written about milk paint and chalk paint but everyone wants to know 'what is the difference'? These pointers should help you decide which one is right for you. Are Milk Paint and Chalk Paint Different? Yes! The paints contain different ingredients and create completely different looks. Milk paint recipes have been used for centuries. They are natural and eco-friendly. You can make your own paint following the video below or buy ready made powders and just add water. The main ingredients are milk (or quark) and lime. They mostly come in powder form which you have to mix with water, then stir like crazy to get the lumps out. This is part of their charm and their curse, especially if you are expecting a thicker paint consistency. You should consider using a blender if you are planning on painting large areas. Chalk paint can be non-toxic or toxic depending on the supplier, so make sure you read the tin before buying. Both paints give amazing paint finishes; chalk paint finishes are thicker and more consistent, whereas milk paint is often less predictable. Now, let's look at some of the differences between the two famous paints. Buying milk paints is easy. They come in powder form, often in a small brown paper bag and super easy to carry. Making up a milk paint recipe is easy too - just add water and stir. This means you make only what you need, along with the intensity or color. It results in a rich, lustrous and complex finish that improves with time.' Here are the main milk paint characteristics. It can be applied in a few hours. It's very easy to use which is great if you are new to painting. While it doesn't chip like normal paint it can be scratched. 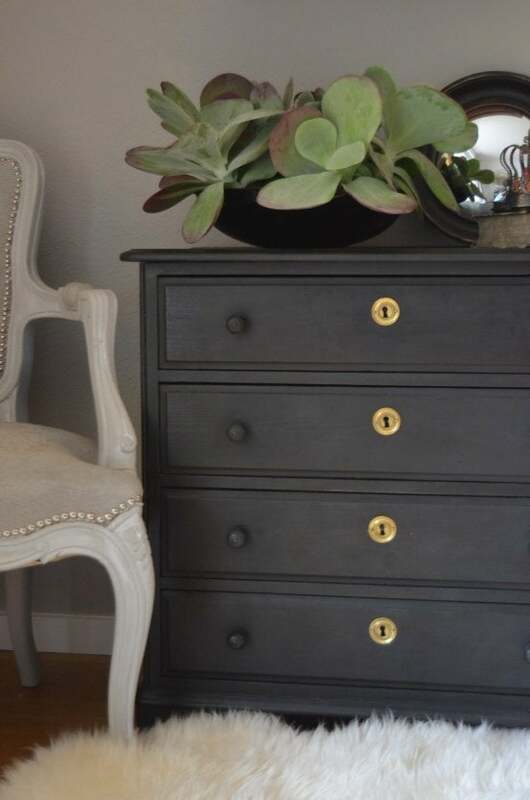 Milk paint needs a bonding agent if you don't want to an antique or distressed look. Without a bonding agent, it self distresses over time. If you add a bonding agent, add it to your milk paint before you start painting. The paint effect creates subtle differences in tone and color. You can mix powders and create new colors. Milk paint looks better as it ages. It ages beautifully, looking more polished with different levels of sheen. There are no fumes during use, and is safe enough to go down the kitchen sink. Milk paint is water based. It soaks into the wood unlike regular paint that forms a coat on the surface. For the best effect, use thinner, not thicker coats. 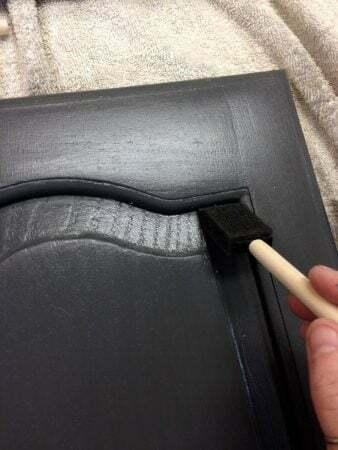 It doesn't require sanding your furniture which literally saves hours. That doesn't mean you shouldn't sand if there are rough surfaces but it's a great start if your piece is half way decent. This really depends on the kind of effect you want but sanding is optional. See Miss Mustard Seed for more on this. Milk paint bonds well to fresh, raw wood or to itself. You can apply it with a brush, roller or sprayer. If you use a sprayer strain the milk paint; a few times. The first coat of paint seals, the second coat covers. Some people like one coat, others prefer two or three, especially if they are layering colors. My suggestion is to allow the first coat to dry completely, then apply the second coat. 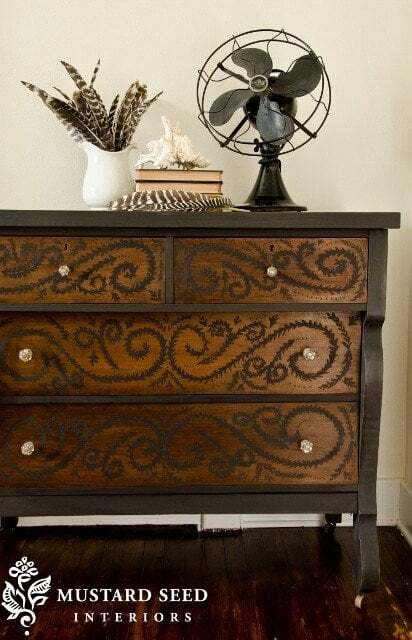 Milk paint can be unpredictable when it comes to distressing. You can get some amazing looks if you're happy to experiment. Manufacturers recommend a one-to-one mix. Most people mix and shake it in a clean, wide mouthed jar which makes it easy to dip the brush. Shaking creates a paint full of air. Allow it to sit for an hour to allow the solids to settle. Stir before you start painting and regularly while you paint. When mixing use hot water (preferably filtered). This helps to dissolve any clumps, and gives you more paint and a more accurate color. Stir for a few minutes until you get a consistent liquid. Don't panic about any clumps as they don't show up when the paint dries. Some like to use a blender to get a frothy milk paint while others say its best to mix by hand. It's best not to buy large quantities of milk paint powder because over time is absorbs moisture from the air and can lose its ability to bond with wood. Unused milk paint should be sealed and kept in a dry area. Mixed milk paint also goes bad so use it on the day it is mixed or leave it overnight in the refrigerator and use the following day. Hemp oil is a great top coat for milk paint. You can also use a wax or poly topcoat. Top coats are optional but they protect paint from moisture and wear and best for furniture used regularly. Oil gives your piece a darker, rich color and luster and protects it from spills. Milk paint is non-toxic. It doesn't contain lead or any other nasties. There are great tutorials all over Youtube if you want to learn more. I found this great video that also explains the differences between the two paints. But read on for a few tricks of the trade. Milk paint starts to get interesting when you layer paint colors on top of each other to create truly unique finishes. Professional chair makers and painters apply multiple coats of different colors such as Lexington green as the base, followed by Barn Red and topped off with Pitch Black to create a subtle tortoiseshell appearance. Try this with blues, yellows and greens or grays to get soft neutral looks. This may sound, using three colors, but wear and tear creates a close imitation of an old paint loved by antique collectors. The amount of water you use also changes the finishing effect and end results. If you thin your milk paint with one and a half parts water to one part paint and you've created a color wash. Add more water and it becomes a color stain which you can wipe off with a rag. To get a smooth finish, strain the paint using a strainer or old pantyhose. Leave it unstrained and you will get a grainy, less appealing, finish. Its a good idea to spray your furniture with water before you begin painting. This will show any residual glue or oil to be removed; preventing the milk paint from bonding with your piece. Recipes to make your own milk paint can be found at Martha Stewart, Real Milk Paint, Esprit Cabane and a cheat's version using acrylic paint from Craft Apple. It is often said that milk paint has a mind of it's own - (read 'it looks and sticks differently on each piece.') This is worrying for some but for most people that is part of its charm. One of our readers pointed out Milk Paints that are 100% acrylic paints like General Finishes. They are not true Milk Paints but give a great result. "It’s never gone chippy, and gives a nice smooth finish. I’ve been so happy to be able to give new life to wood products without sanding!" Kristie O. Now let's look at chalk paint, starting with a Annie Sloan chalk paint tutorial who coined the term 'chalk paint'. Chalk paint sticks easily, which means it doesn't need a primer, and you can leave out this step. This often depends on the chalk paint manufacturer, and its wise to test it first. This also means less worry about old oil or glue left on your piece. It doesn't need wax or a varnish coat which makes it super easy to apply. Always consider wax, oil or varnish if you want to protect your piece. You can mix it to create custom chalk paint colors. There is a growing selection on the market such as Annie Sloan, or Websters Chalk Paint to choose from but if you want your own colors - you might want to make them. You can apply chalk paint with a brush, roller or sprayer. Chalk paint distresses well. You can distress before or after you wax. Chalk paint comes off in a fine powder if sanded. Just sand back to get the look you want for a soft, distressed finish. It's the calcium in the paint that give it a chalky finish. If you are doing a large area like a kitchen and the price of using a store bought chalk paint like Annie Sloan looks prohibitive (read scary!) then this simple recipe is a great way to create your own substitute and get great, hard wearing results. Depending on the size of your kitchen, a gallon of paint could be more than enough. Make sure you get every lump out of your mixture, unless you don't mind a streaky look. Remember, this mixture goes a long way, and it's inexpensive, so you can be generous. To protect your cabinets, think tough; think decking. These are simple and inexpensive recipes, the cheapest is $4.00 from Elizabeth & Co. You simple use latex (acrylic) paint mixed with either grout, plaster of Paris and powdered calcium carbonate. If you are using chalk paint for your kitchen cabinets, you should watch this video to see how they look after 2 years in a high traffic kitchen. The video below has 4 chalk paint recipes and shows the different finishes they create. Some are easier than others. If you have all your gear and want more painting and waxing techniques and ways to make chalk paint there are four great videos here. Even on a budget, there's no excuse for not getting your hands on chalk paint. Still on the fence about buying or making your own chalk paint? Homemade chalk paint is easy to make, there is no prep work on furniture, since it sticks to any surface, and its cheap! Finish off with a wax or other sealer and you have a long lasting finish. You can age it with simple sanding or distressing and, most of the time, all you need it one coat of paint. The downside is has a rough texture when dry and needs sanding between coats and may need some water added to it if it becomes clumpy. Not so hard, so far. And Annie Sloan Chalk Paint? Again, there is no prep work, priming or sanding. There are lots of varieties of DIY chalk paint that are less expensive and very smooth and easy to work with. You can layer colors and it dries with a velvety finish. needed. Most of the time only one coat is needed and its easy to age or distress. There is an ever expanding color range but Annie Sloan Chalk Paint is more expensive - even compared to other Chalk Paint brands, which do a similar job. Annie Sloan has a lot of chalk paint tutorials but you don't really need them to get the process right. The subject seems inexhaustible but I hope this answers some general questions. Thank you for a great blog post that is totally chocked full of great tips and information. LOTS of chalk painted furniture examples on my blog and Facebook. Enjoy! Thanks for such a comprehensive article Christine! And what a nice surprise to see a link back to my blog - Elizabeth & Co. I love experimenting with all kinds of paint. Each one has it's own unique qualities and allows you to create a truly custom look. ... Thanks again, I always enjoy the time I spend here! Thanks Sharon! You know I love visiting Elizabeth and Co too and see what you great gals are up to. ACK~ Well, they look almost the same! I was planning on doing chalk paint on my kitchen cabinets (which are only 5 years old, but stained a very dark color, which makes my kitchen very dark). 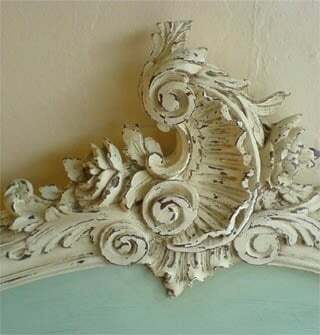 I was planning on using AS, but now I think I'll get a low/no VOC paint and make my own chalk paint. 🙂 Thanks for the info! Hi Jodi, what did you end up using on your kitchen cabinets? ....And how did they turn out? 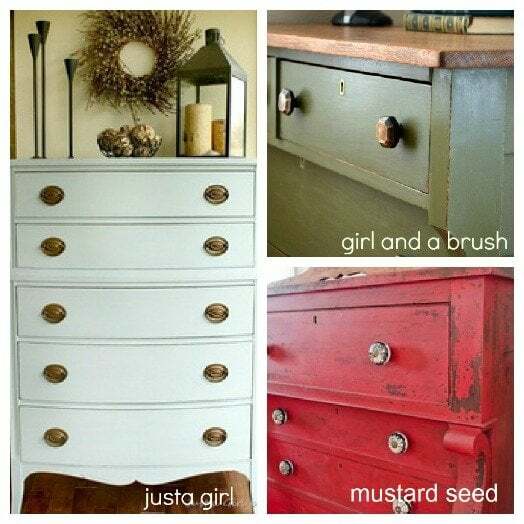 I'm looking at doing mine and was also considering milk paint. After you were done, what did hoy seal them with? Hope all is going well with your decorating! Great article! I'm going to start a project soon and you've covered a lot of questions I had. Thank you! Stacy - thank you so much for dropping by and very happy you liked the Chalk Paint Vs Milk Paint article. There are more ideas on how to wax and polish to get different results whenever you get time... don't you love home decorating! how many square feet does a quart of Annie Sloan's chalk paint cover? I would love to re-do my kitchen cabinets but don't want to spend several hundred dollars in paint! Thanks for any help. Thanks for the email! A quart of Chalk Paint® will cover about 150 square feet; which is almost double a quart of Latex. This depends on your style pf painting or the look you want. Some people can get even more surface coverage out of a single quart. Good luck with your kitchen cabinets! Do you have to sand furniture bought 35 years ago with a varnish already on it? I is supposed to be solid oak but I feel sure the side ends of it are probably a laminate of some sort. It is not shiny unless we use furniture polish on it regular. it depends on the paint you are using and the finish you are looking for. 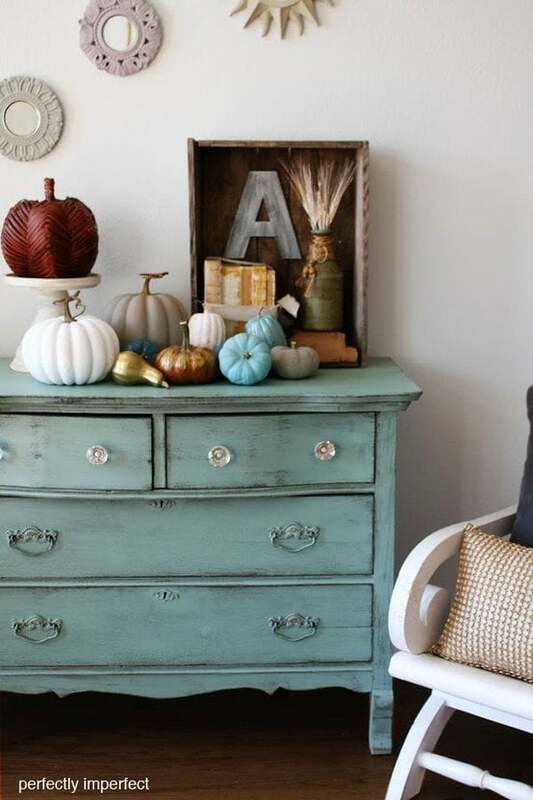 If you are using Annie Sloan's Chalk Paint then the answer is a healthy 'no', no sanding. Most other chalk and milk paints make the same claims. The finish, which is up to you entirely, depends on the wax you might use. Here are two more blog posts with some more ideas on finishes. https://decoratedlife.com/1950s-french-dresser-1800s-france/ - this one shows different antiquing effects including a link to distressing. https://decoratedlife.com/7-painted-furniture-trends-trending-painting-techniques/ - this one has a few different effects that might help you too. I hope that helps! Good Luck! Have Fun! Hi, I'm thinking about painting my kitchen cabinets. I don't want a distressed or chipped look. I just would good coverage on my pickled wood cabinets. I was thinking about painting them either white or mocha. What would you suggest milk or chalk paint? Which one would hold up better? I enjoyed reading your blog. for some reason I only received this now... very strange. Chalk paint sounds like the look you want! The color depends on the rest of your house and there are so many whites to choose from with different undertones. You can of course do white with mocha trim too. Test the two colors you choose first on a cabinet door or drawer to get an idea if you would like the whole kitchen painted in that color. Hope you didn't get this months after!! Can I start painting kitchen cabinets with Annie Sloan's chalk paint without any prep no matter what finish they have on them. They are from the 1950's era. Thank you. yes, you can use Annie Sloan directly on to any finish! Some people like to do a little prep work but its not necessary. Depending on the type of surface, you might like to test it on a piece first to make sure its the look you want. Hey Christine. Great article. But 2 things - you should always clean a piece with a degreaser before using any chalk paint. Secondly, Amy Howard One Step is a great chalk-based paint that can be custom-mixed into any color at your local Ace Hardware! Thank you for all the information! I was wondering what your thoughts are (chalk vs. milk) on distressing barn wood/reclaimed wood. I have only used "watered down" chalk paint and sanded however have been wanting to try milk. Any thoughts on this? thank you so much for the email... Watered down chalk paint will look similar to milk paint but milk paint can have a more 'chipper' or distressed look about it, whereas chalk paint can have a more solid, powdered look. It also depends on the surface you are painting on. Best thing... try it! Good luck.. sounds like fun! Thank you Christine for replying so quick! I will have to give it a try. Milk paint may be what I'm looking for and my long lost friend. There is one big difference between milk paint and chalk paint - milk paint is not toxic. If you look at the msds sheet for Annie Sloan chalk paint there are a few disturbing ingredients and on the side of the can it says there are ingredients that cause cancer and pthalates that disrupt hormones. I have thrown out any chalk paint I had I will only use milk paint form now on. Also Annie Sloan wax is made up of mostly naptha a petroleum product that can cause cancer. I use orgainic hemp oil and beeswax instead. People don't be fooled by these manufacturers - they don't care one bit about your well being and as consumers we need to be smarter! thanks for the comment. You are right, of course. Milk paint is non toxic and the better health choice. Wise words. NOW.....what about "mineral paints"??? Fusion, Billy Goat??? I am curious.....seems to be smoother?? for a smoother satin finish, it is probably best to stick with chalk paint. Milk paint can get into the chippy state fairly quickly. Wax can make all the difference... If you are using AS then look at the range of waxes. Look at some of the videos on the blog too - especially if you are looking for an antique look. If you have a larger area and cost is an issue, you can cover chalk paint with the protection and shine you want with a varnish, not wax... Test! is my recommendation to get the result you want. Sorry, to sound vague but each piece can react differently to these paints. Good luck! Thanks for responding. With regard to testing, I wish there was a kit with say... oh 6 colors of paint, some waxes, a couple brushes, and instructions so one could test / play around with the paints. I'm one of those who wants to paint it, love it, and be done with it! lol Seriously though, I'd buy a kit to get a feel for the process. Chalk paint classes are so expensive and depending on who is teaching, one can either paint a piece of wood or an actual piece of furniture. that's a great idea.. now let me think about how to do it? HA! I'm like you.. fast track, please! You have a picture above of a dresser in a darker blue...what color did you use for that? Thank you for the email.. its Annie Sloan's Amsterdam Green with a dark wax on top - but you could also use Graphite. I didn't paint this piece... you can see more of the original here https://ciruelointeriors.com/2012/09/02/back-to-dark/. Good luck! Hope it all works out! It's a beautiful piece. Thank you for your fantastic informational blog! I have a completely different project I've been contemplating for some time. And, it seemed a little daunting (esp when speaking to most people). However, after reading about chalk paint, I'm thinking this could actually be my saving grace! To my dilemma- I would like to whitewash the walls in our (small) bathroom & (tiny! )1/2 bath. Our small 1950 beach cottage was finished with all knotty pine, shellacked, walls. We do enjoy their warmth, but thought the bathrooms could easily benefit from a update. I am looking for a wash, not solid color, and am concerned about peeling, though I'm thinking it may not be a problem with chalk paint!? Do you think I still have to sand 1st (as needed with regular paint because of the shellac), and what might you recommend I finish it with after? I really appreciate any suggestions you might afford me!! great to hear from you and thank you so much for taking time to write. Yes, chalk paint should do the job. You don't normally have to sand especially if you are using Annie Sloan's chalk paint, but I think that depends on the condition of your walls. I think you'll be just fine on walls. There is now a wall paint - https://www.anniesloan.com/annie-sloan-products/paints/wall-paint.html but not sure if you can get it. The wall paint doesn't need a finish. Great article! I am new to the milk/chalk paint world. I have read several places that you don't have to sand or prep kitchen cabinets before painting with these choices. Have you ever tried either one of these paints on oak cabinets without removing the finish beforehand? Which type would you suggest? Thanks bunches!! if you are using Annie Sloan you can just paint! Its amazing. There are other paints but most of them need some prep work and it depends on the condition of your cabinets and how smooth a finish you want. Annie Sloan is more expensive but it goes a long way. Sounds like a great project! PS There are other articles on the site with videos about using these paints - and Annie Sloan has more videos on Youtube. I think I would use chalk paint in the areas with more traffic, because there's less risk of it chipping- unless you want that look.And milk paint on pieces that are either out of direct traffic like a sideboard and could do with a little character. Milk paint can be tricky and it depends on the surface and can chip easily. Great for rustic or country pieces. You project sounds great! However, it turns out ... I'm sure it will be better than you expected! PS.I'm so excited about this project. I am going to use old 2" thick barn board tongue and groove for the countertop. Hope it turns out close to how I have it imagined. ???? What about a coat of chalk paint for the base, with milk paint for color washing. Does that work? I'm totally new to painting furniture but loving it. thanks for the email! It can work but there are so many variables that you could end with a look you don't like. I suggest trying it on sample piece first to see if the look matches what you are looking for. Milk paint is unreliable when it comes to finish... but try it first. You could end up with something amazing! Hi there!!! Like some of the others above, I am new to this world. I have a dresser and crib that I need to re-finish for my daughters nursery. I was going to do chalk paint, before I read someone's comment about it being toxic. I don't want to distress it... just a nice even finish to take a dark espressso wood to solid white/cream. Thoughts?? thank you so much for writing in. No, only some chalk paints are toxic. Not all of them, so be careful which ones you choose. Annie Sloan is a non-toxic paint that is lead-free, EG-free, odour-free and has very low volatile organic compounds (VOCs). It can be applied to most surfaces and very rarely requires any priming or sanding before painting. It is more expensive but it is a great paint. There are other non-toxic chalk paints - I just googled it and found quite a few different brands. Take your time to find the right one for you. Some people choose milk paint because it is also non-toxic. Miss Mustard Seed's Milk paint is made from five simple, non-toxic ingredients – clay, limestone, chalk, casein (milk protein) and natural & non-toxic synthetic pigments. Good luck! You choice a neutral white/cream sounds perfect!! I'm sure it will look wonderful in your daughter's nursery. This article is so helpful! I never heard of chalk paint until I looked for an alternative to milk paint. I want to do oak cabinets with verathane or something similar, and also what I think is a laminate tabletop. I was all set to use chalk until you mentioned it having a rough finish. I want the cabinets to be shiny and smooth, would normally use latex enamel. Can the enamel be mixed with chalk, or should I use a different paint? Is there a pre-mixed chalk paint that would be better? How do I get a smooth finish? Do I need a different finish for the table? Thank you! 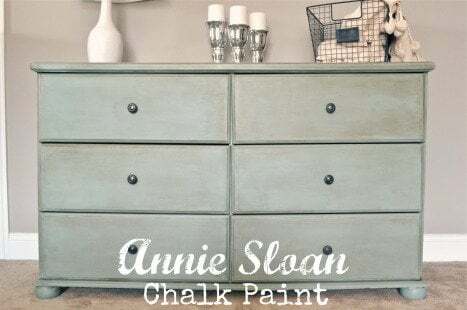 this sounds like a big job and to make your life a little easier you might be better off using Annie Sloane's Chalk paint. The rough or chippy look is what some people like but you can get a wonderful smooth finish with chalk paint. You can use it directly on anything, including laminate and plastic. You don't have to prep either which is a huge time saver. Watch some of these youtube videos below but there are hundreds of videos - one of these is on laminate wood and the other on wood. Hope they help. Annie Sloane has a number of finishes - but you can use a normal varnish or a wax to set it. It is more expensive but a little goes a long way. I have included a couple of Annie's videos so you can see technique and a link to Amazon to see what is available including brushes and wax. Take the time to look at more videos to get an idea of the look you want; modern, antique, retro etc and I'm sure there is one that will help you enormously. THANK YOU Christine! That was so helpful! Luckily it's only an RV, so not many cabinets, but the table is hideous. My one issue with her is she doesn't have the color I want,just a slightly off-white. I wonder why she doesn't sell all her colors in the US? Maybe I can blend her lightest shade with white. PS: I notice there are a LOT of Chrises of various spellings around here! Kinda funny. I think you should watch this youtube video with a time lapse on a kitchen in Annie Sloan Old White. Don't forget to read the description under the video because they go into details of which paint colors they used. Just to clarify, I mean the cabinets are currently coated with verathane. Hi! I came upon your blog and I'm so glad I did. I've been back and forth on if and how I would want to change my honey maple cabinets. I've found the pic of exactly what I'd want were I to go lighter! 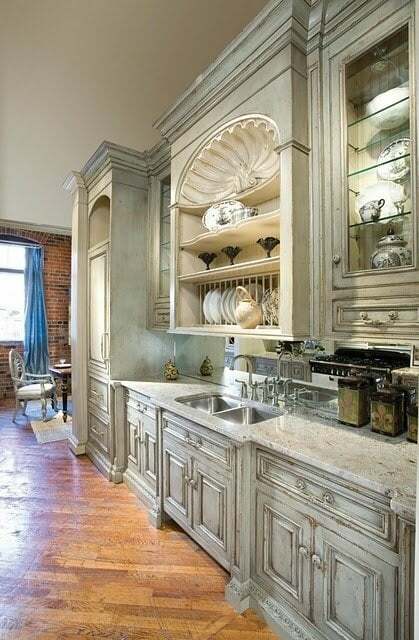 There is a pic at the beginning of this blog that shows kitchen cabinets that were professionally done. Can you please provide the link to the site that has this? I also signed up for your newsletter in case the info is there. I'm new to all this and although I've visited an AS store locally, I've never attempted anything yet. I'm looking to start with a pair of candlestick holders and a small mirror, just to test. BTW, I had a Navy wife who lived behind me and she refinished furniture as her own personal love while making $. She swore by General Finishes but this was all she used because of durability as she sanded and waxed everything. Do you have any experience with using AS or milk paint and sealing with GF? Thanks in advance for your help! thank you so much for the email. Here is the link https://habershamhome.com/featured-products/galley-kitchen/ and a link to their kitchen gallery. Its a good idea to start small with say candlesticks to you can get an idea of how AS spreads, dries etc. You may need more than one coat. Don't worry it the first coat looks awful. By the second or third you will have something really gorgeous. I haven't tried General Finishes but remember with AS you don't have to prep or sand. I am doing a hockey chair for my great nephew in black with the seat covered in his team material. It is black background with red & green. What I take from reading everything is if I want it to look smooth with no distressing I should use Chalk paint? Also is it alright to use polyurethane instead of wax? What a lovely thing you are doing for your great nephew. Yes to both your questions. Chalk paint gives a very smooth finish. The first coat always looks all wrong... but by the second/third it looks amazing. And no prepping! It might need a light sanding between coats, but not always. You can definitely use polyurethane instead of wax, which is probably more hard wearing for your great nephew. All the best! Sounds great. I am an independant paint retailer in south Africa. I sell chalk paint but i am very interrested in your product as it is not known widely in south africa. I don't sell paint. This is a blog that talks all about different paints available in the USA. Thanks for this comparison, it’s just what I was looking for! I have only used milk paint - and only one kind, which I love and have used for vanities and even high traffic banisters. It’s made by General Finishes, is just like regular paint (no need to go crazy mixing it in a blender 😉 and while we always put a clear coat on top (by same manufacturer, it’s never gone chippy, and gives a nice smooth finish. I’ve been so happy to be able to give new life to wood products without sanding! Thank you for the recommendation - I will add it to the list. Its always great to get a recommendation and its good to know that there are other great milk paint products that work!